The Birman is a color pointed cat with long silky hair and four pure white feet. It is strongly built, elongated and stocky, neither svelte nor cobby. The distinctive head has strong jaws, firm chin and medium length Roman nose. There should be good width between the ears, which are medium in size. The blue, almost round eyes are set well apart, giving a sweet expression to the face. Coat colours: Chocolate Point, Lilac Point, Seal Point, Blue Point, Lynx Point and Parti-Colour Point. 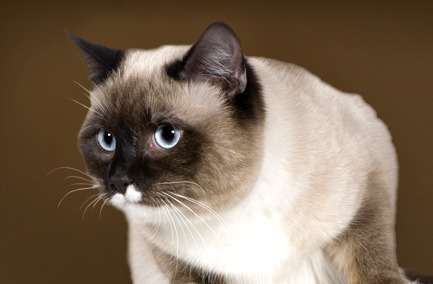 Developed from crossing Persians with Siamese, these blue-eyed beauties are not as docile as a Persian and not as vocal as a Siamese…the best of both worlds? Their kidney function tests (BUN and Creatinine) are often higher than most cats despite perfect health.